How do you sell a city? Getting businesses to set up in your location, bringing investment and jobs, can be a tough ask. With so many locations to choose from, companies can have their pick and social media can be a powerful weapon when it comes to promoting your city. 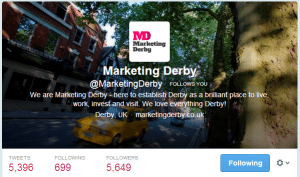 So when Marketing Derby was named as the top Twitter users in the field of inward investment in a recent report, it was a vital sign of social media success. 75 regional and local investment teams were investigated for the Breeze report, focusing on their use of Twitter, LinkedIn and YouTube. As well as coming number one on Twitter, Marketing Derby were named third overall for social media use. Robbie Jones says the key to the success was trying out new things. The Breeze report used a number of metrics when deciding the best Twitter user, including quality of account design, number of followers (weighted against population size), number of followers from the inward investment community, frequency of tweets and amount of engagement. But what about quantifiable success in bringing in investment for Derby? Robbie Jones says that Marketing Derby are seeing promising signs. “During our Derby Property Summit in May last year, we worked out the gross audience that saw our tweets topped 2.3 million. In the business we are in, it could take 2-3 years before we see the benefit of doing the show let alone the social media around it! If you want to know how Status Social can help you with your social media call us on 01332 776910 or email us.